(Newser) – A snow-covered tent has been the only possible sign of two climbers missing on the world's ninth-highest mountain since Sunday. 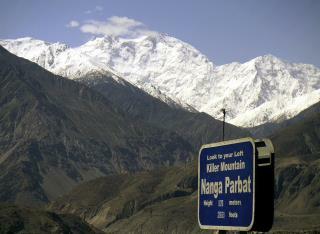 A flash of reddish-orange fabric amid a sea of white was spotted Thursday during a helicopter search of Pakistan's 26,660-foot Nanga Parbat, which also turned up evidence of heavy snowfall or possibly an avalanche, reports Rock and Ice. Brit Tom Ballard, 30, and Italian Daniele Nardi, 42, are last known to have reached 20,670 feet, or more than 3,000 feet above the tent's position. The experienced mountaineers set out in January hoping to be the first to scale Mummery Rib, the steep western face of the peak dubbed Killer Mountain. They persisted through poor weather and heavy snow, even as two Pakistani team members abandoned their efforts, per Outside. Darwin. I wonder how much money is being expended to search for them. People who engage in dangerous hobbies should be required to post a search and rescue / recover bond in the amount which is estimated to be needed. When that money has been spent, all efforts to find them should cease. Stupid people dying doing stupid things.